Hernandez was actually reacquired by trade late last week from the Washington Nationals, for whom he flamed out this season already — and to whom I was only too happy to see him go a year ago (and that was for Luis Ayala). I know, with the way things have gone this year this is about what we’re going to get but it doesn’t remind me any less of Wilson Delgado and Ricky Gutierrez stinking up the joint out there in 2004. Hernandez’ addition to the roster resulted in a DFA for Berroa and for Anderson’s third different number with the Mets — he’d worn 1 and 4 in previous visits. The Mets also replaced the injured Jon Neise on the roster by recalling Elmer Dessens from AAA. Dessens was back in No. 64. Tonight’s beatdown included the return of reserve middle infielder Argenis Reyes to the team, who stepped in for lefty Jon Switzer (and hopefully won’t stay for too long). And despite his former No. 4 being made available by this week’s designation of Wilson Valdez, Reyes suited up instead in No. 11. But the news on Reyes is what he wasn’t wearing a few weeks back with AAA Buffalo. Yes, he went to the disabled list with injuries related to taking a shot in the onions while not wearing a cup. Brandon Knight, who was 28 last time around, has switched to No. 44, even though an argument could be made for 22. Gustavo Molina also arrives in a new number; he was 6 when he showed up last. The 49 of Niese and 36 of Al Reyes represent uniforms available as the result of Ruddy Lugo and Willie Collazo being dropped from the 40-man roster, respectively. The recall of Muniz is his fifth this year (to accompany 4 demotions). Welcome back, Ryan Church. The brain-damaged Mets right fielder returned Friday after a lengthy absense while superfluous catcher Robinson Cancel was sent back down to AAA. A more difficult, Obama-picks-a-running-mate type question faces the Mets on Saturday, when unpopular second baseman Luis Castillo is expected to return from an extended break during which he was barely missed. To be honest the solution ought to be clear if painful —Argenis Reyes for all his good press isn’t the kind of hitter you couldn’t do without for a few days and to my knowledge only plays second base, so Castillo is probably an upgrade. Castillo in fact makes fewer outs than either Reyes or Damion Easley, and if actually and finally healthy, then he’s the player they probably ought to have out there. A strong offensive showing out of the gate is essential though. If Reyes won’t go down you wonder how seriously they’re ready to consider Duaner Sanchez who clearly isn’t the same as he once was, while Luis Ayala is (what he was once but wasn’t recently). Met-Lovin’ Big Shot George Thorogood is a guest on this week’s episode of Mets Weekly on SNY, airing at 12:30 p.m. Saturday. 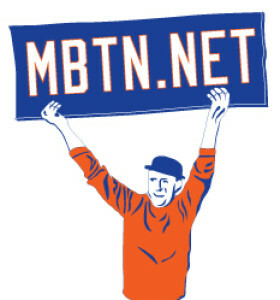 The SNY people pursued Lonesome George as a profile subject after seeing the interview published here. The Mets prior to Friday’s game recalled catcher Robinson Cancel (again) and designated Chris Aguila for assignment (again). This facilitates more pinch-hitting opportunities for Ramon Castro but invited a new uni controversy as Cancel returns only to find the No. 4 jersey occupied by twitchy new infielder Argenis Reyes. Reyes appeared in the game wearing 4 — and readers Rich and Zach report seeing Cancel warming up Muiniz in the bullpen wearing No. 40 (“guess they FINALLY gave up on Burgos wearing a Jersey anytime soon,” sez Rich). 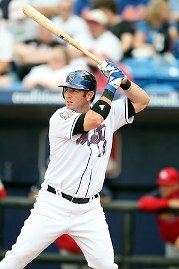 Cancel would become the first position player to wear 40 since the infamous Tony Tarasco in 2002. Most recently, 40 was exchanged between Brian Bannister to Ambiorix Burgos when they were exchanged for one another. Seven in a row, and once again, we prevailed vs. the other guy’s ace. Willie was right after all — these guys are all winners! Sorry to hear about Bob Klapisch: Maybe not the favorite writer of Mets fans, but his Worst Team Money Can Buy is the prematurely definitive story of a sorry era in Mets history, and probably more interesting today than it was back then, if only as a relic of Old Media.